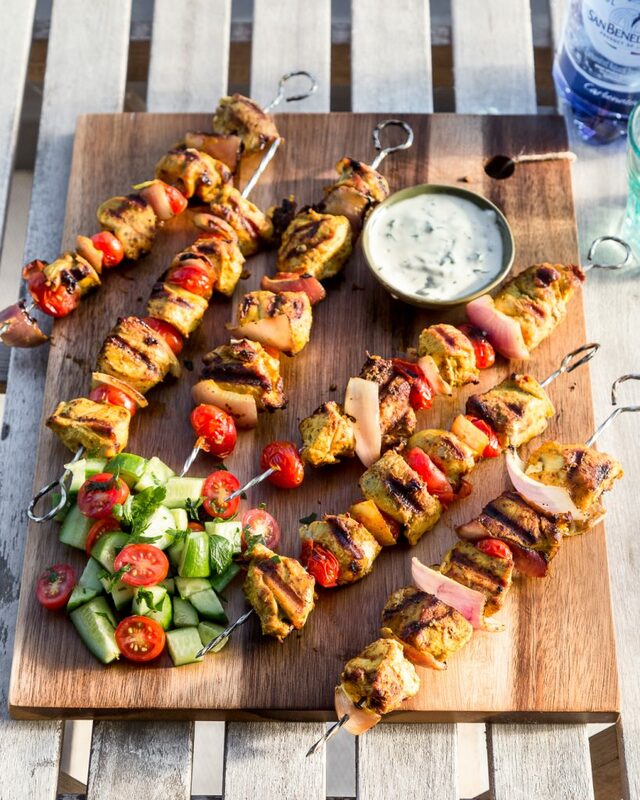 These Spiced Chicken Skewers are ideal for summer time grilling. They’re an ode to the Middle Eastern flavours I love so dearly. 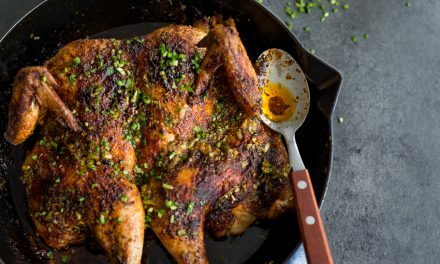 Spices like turmeric, cumin and sumac all get combined and permeate the chicken with warm and bold flavours that conjure up feelings of summer. 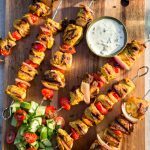 The skewers are easy, delicious and can be marinated a few hours in advance, which means you can enjoy more time with friends and family. 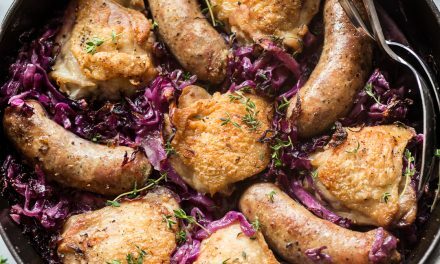 They also happen to be Whole30 and Paleo but you’d never guess because of just how flavourful they are! Before we dive into the recipe, I will try to anticipate some questions about the skewers themselves. I recommend purchasing metal skewers because they are reusable and sturdy. If you decide to purchase metal skewers, I suggest looking for ones that are wide and flat, as opposed to round and narrow. These ones on Amazon seem like a decent purchase. The flat edge will help hold the meat in place while grilling. Alternatively, you can purchase disposable Bamboo skewers for pennies on the dollar. Not as eco-friendly but if you are cooking for a large party or event, this might be a more practical option. I’ve made many chicken skewers in my day and have learned a few things along the way. Most importantly is the secret to a good marinade. Obviously, there are plenty of options to choose from but no matter what you decide I strongly encourage you to take the time to marinade your chicken for a few hours before grilling. You can, of course, choose to skip the marinating time, which I have been guilty of on more than one occasion, but in a perfect world everyone would be preparing things in advance, chicken skewers included. As far as marinades go, there are several fundamental options to choose from. You can go the conventional route and marinade the chicken with some oil and acid, such as lemon juice or vinegar. 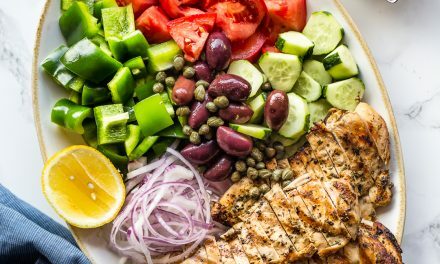 My Grilled Chicken Greek Salad is a perfect example of this. While the oil adds some flavour and prevents the meat from sticking to the grill, the acid helps tenderize the meat. 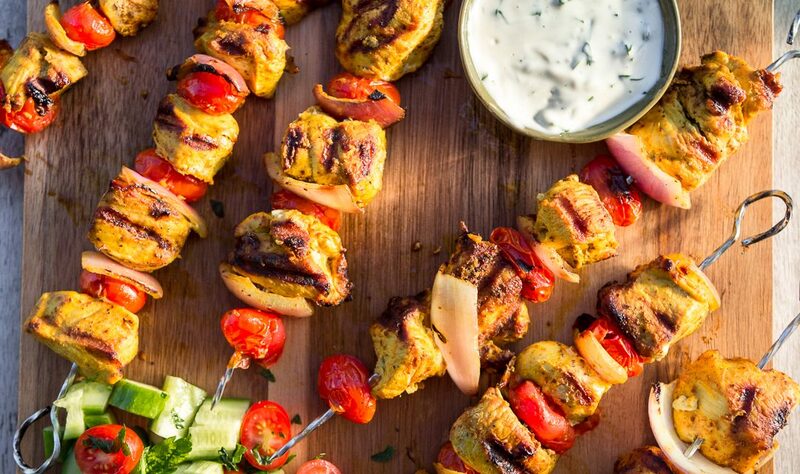 Another popular option for marinades is to use yogurt. This is very common in the Middle East and imparts an amazing amount of flavour in the meat. It also helps tenderize the meat and keep it juicy. However, for our purposes (i.e. paleo and Whole30 compliancy), yogurt is out of the question since it’s made from dairy. Nevertheless, you can definitely substitute coconut yogurt, but this is best suited for South East Asian-inspired marinades because of the flavour combinations. Coconut yogurt is becoming more and more available in grocery stores so keep an eye out for it. 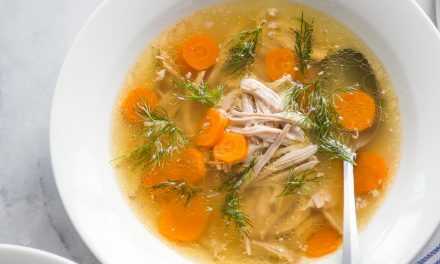 The only downside is that it can be quite expensive, in which case you can try making your own by stirring the contents of a probiotic capsule into some coconut milk. More on coconut yogurt in a later blog post (stay tuned). Perhaps less popular, albeit more delicious in my humble opinion, is marinating meat in mayonnaise. Yes, you read correctly mayonnaise. This is a very popular method for ensuring juicy, caramelized, delicious meat. A number of Mediterranean style restaurants in Toronto do this and the result is always fantastic. In fact, I first picked this trick up when I worked as a prep chef for a grand total of 2 days back when I was 17. It was my first and only experience working in a professional kitchen but I’m glad I walked away with a little nugget of insight because it’s been paying dividends ever since. Since this recipe is paleo and Whole30, it’s important to either make your own mayonnaise using avocado oil or buy one that is compliant. You can head over to my saved Instagram Story highlights for the easiest paleo and Whole30 homemade mayo recipe. 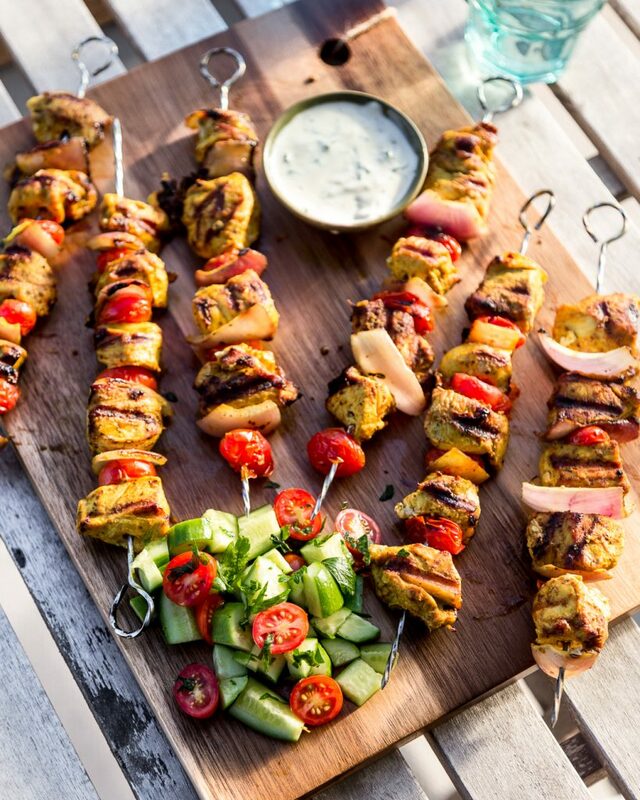 As far as dipping sauces go, you can serve the grilled chicken skewers with your favourite hot sauce, tahini, or my famous Garlic Aioli. Either way, I think you’re in for a treat that the whole family will enjoy! Add all marinade ingredients to a large mixing bowl, stir to combine. Slice chicken into 1” pieces and add to marinade. Toss everything to coat, cover with plastic wrap and refrigerate 3-6 hours. 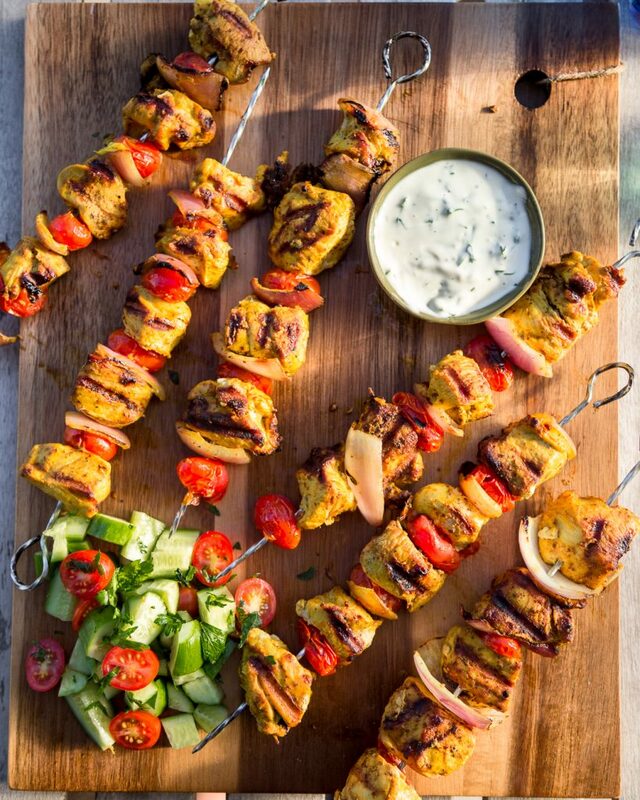 When ready to cook, thread pieces of chicken onto metal skewers and alternate with slices of red onion and whole cherry tomatoes. Note: if using bamboo skewers, soak skewers in water 1 hour ahead of time. Preheat grill or grill pan to med heat. Cook kebabs over direct heat approximately 6-7 min per side or until meat reaches internal temperature of 160F. Remove from grill and cover with foil for 5 minutes before serving.